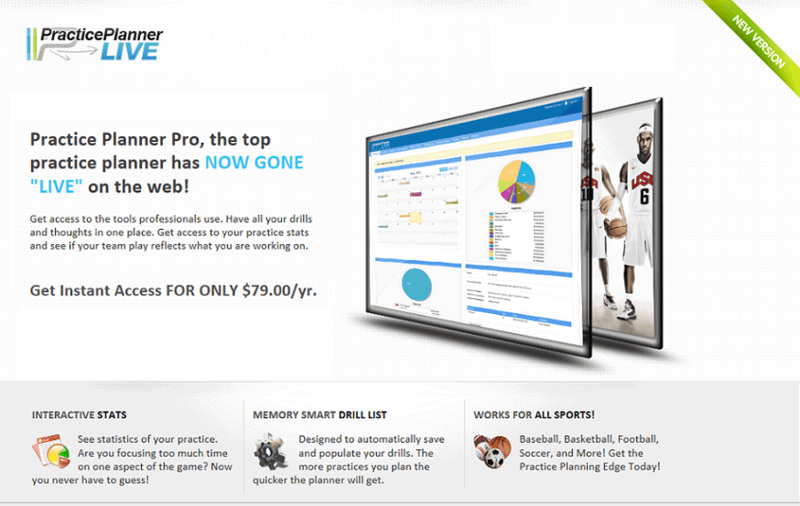 Use this handy, easy to use, online program to do all of your practice plans, player evaluations, and scouting reports! After completing your purchase, you will be contacted by Practice Planner Live (usually within 24 hours) regarding setting up your account, access, etc. This is an online program, so there are no shipping charges, DVDs, CDs, programs to install, etc and nothing to download. Just login to your online account. You will find this program very easy to use and easy to learn. Description: The individual account allows a coach to manage 3 teams (either 3 different teams coached by the same coach (high school, AAU, youth all managed from the same account) or varsity, junior varsity, sophomore teams) plus 3 additional user accounts. (Example: varsity assistant coach, junior varsity head coach, sophomore head coach). All features are included. Description: This pack allows for 3 individual account subscriptions (See Individual Account Description). For example, the boys and girls basketball program and football coach have use of a one year subscription in which they can each manage 3 teams and add 3 additional users. Description: This pack allows for 5 individual account subscriptions (See Individual Account Description). For example, 5 different coaches at a school have use of a one year subscription, each coach can manage 3 teams and add 3 additional users. Description: This pack allows for 10 individual account subscriptions (See Individual Account Description). For example, 10 different coaches at a school have use of a one year subscription, each coach can manage 3 teams and add 3 additional users. Description: The site license allows for all head coaches an individual account subscription. (See Individual Account Description). Each coach can manage 3 teams and 3 additional users. Here are a few screen-shots of the program... the first view shows a typical practice day. Using the calendar, you can create plans for every day. When you click on the calendar day, it brings up your practice plan for that day. Click the Print button and you get a nice printout of your day's practice schedule. When first creating your practice plan, you initially put in all of your drill categories and drills. Then when you create more daily plans, you can quickly select from your drill list. 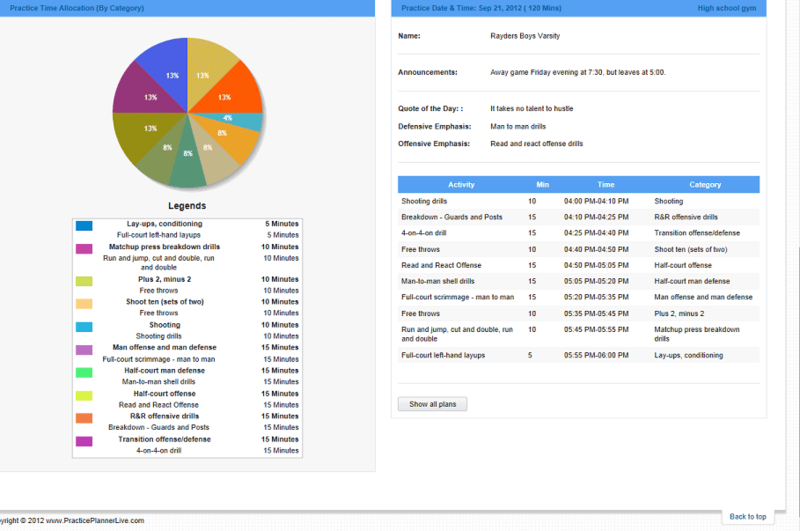 The longer you use the program, the easier it gets... once you have populated your database with all of your drills. You can always add and delete drills and categories at any time. 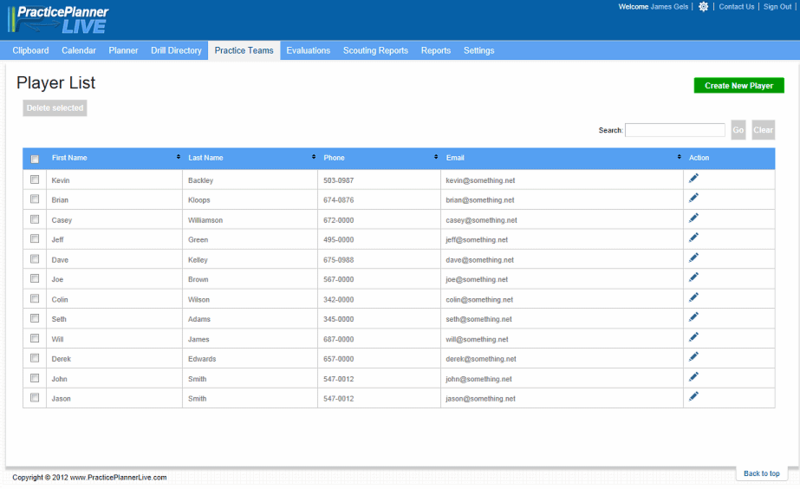 You can also create your player lists with phone numbers, email, etc for contacting players. You can even have player practice squad lists. 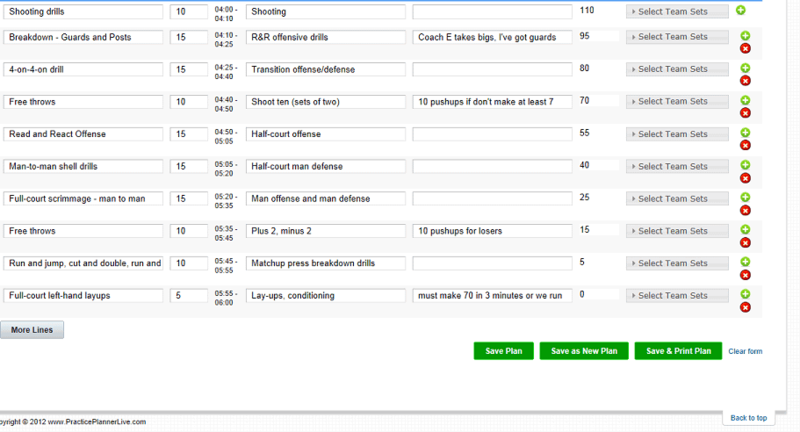 You can also do player evaluations and reports. 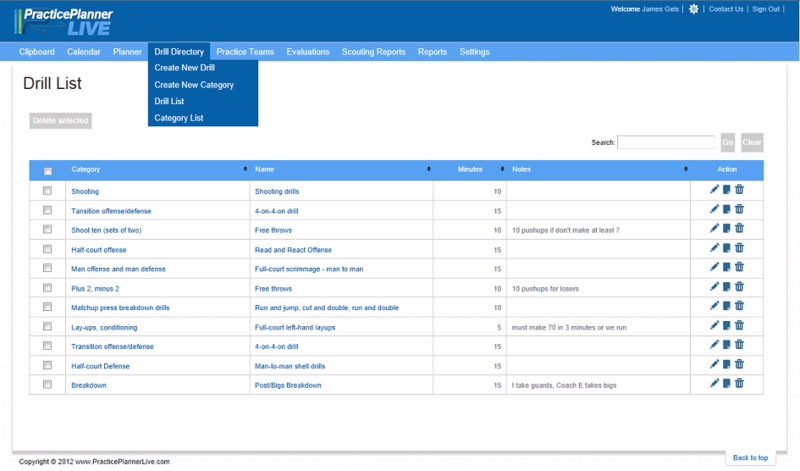 Use this program also to create scouting reports and other reports. It's a pretty nice program! New! 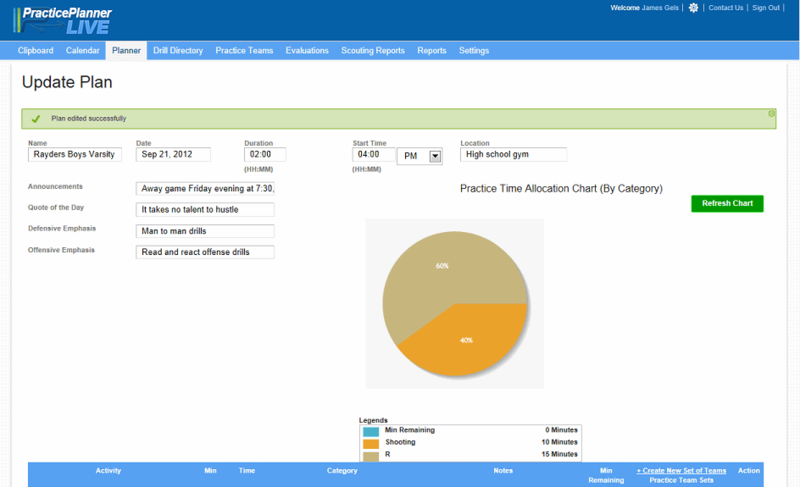 Recently added "Time Splits" feature that allows coaches to create multiple plans for specific time period. This might be used when a coach is doing station work or utilizing assistant coaches in positional work. 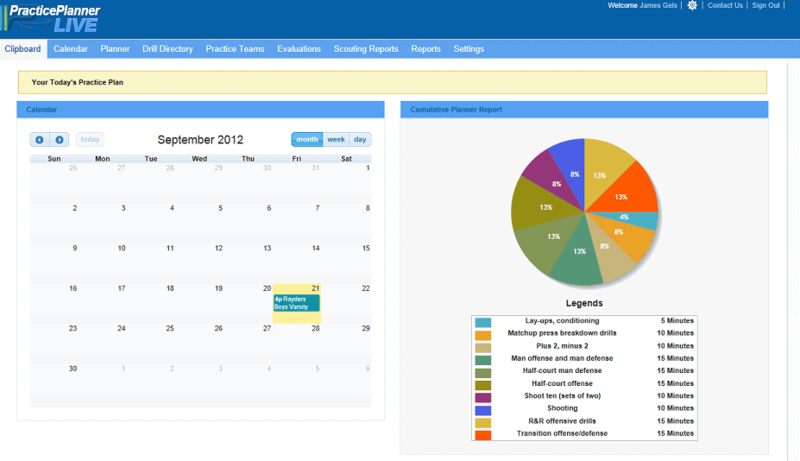 Also note the Practice Planner website revision... looks nice.